Momma needs a date night - Make, Mend, Grow. I love my baby girl, I really do. Sometimes though, I need a night away from her and be with adults. You know, with adult conversations and adult drinks, and food that isn’t whatever kiddo didn’t eat of her dinosaur nuggets or whatever food she’s into that night. A night where I put on the strappy heels, some lipstick and even a dress. Momma needs a date night. After a long few weeks of work I needed that date night more than ever. I texted my guy and said, “I want good food and a cocktail. Let’s go check out Raccolto”. 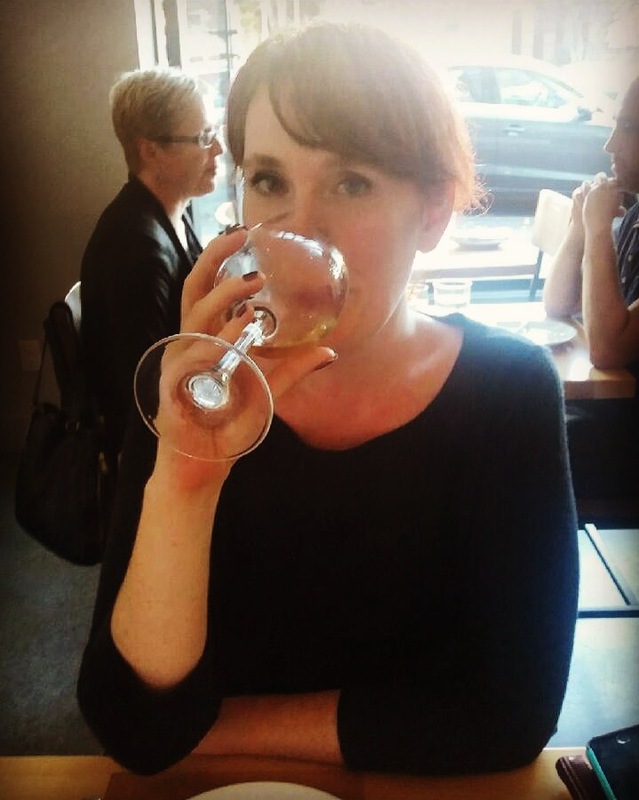 The stars aligned and we got to go out after work and it was good, dear reader, so good. This post isn’t for the faint of heart-I ate my way through that menu, and you should too. 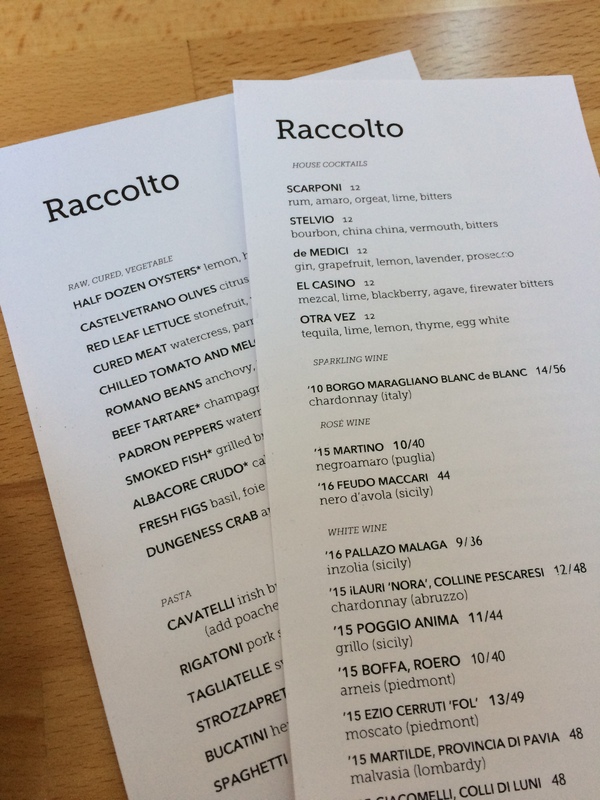 Raccolto opened in late 2016 in West Seattle and I am kicking myself for waiting so long. It’s light, spacious and family friendly and let’s face it, Brian Clevenger is a really nice guy with great ideas around food and drinks. 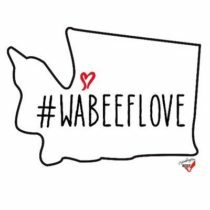 The food is simple, delicious and while it’s overall falling into the Italian realm, it’s also a Northwest restaurant. 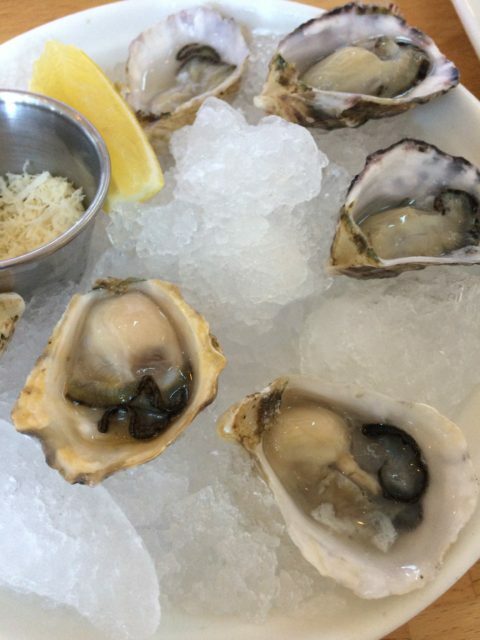 You’ll see things like local oysters and dungeness crab. The menu is seasonal and changes on the regular, so you can try a few new items each time you go. Round one was welcome cocktails-the Scarponi, a slightly sweet, slightly tangy mix of rum and amaro with a dash of orgeat-a syrup made from almonds as well as the de Medici a fun twist on the French 75, with a slightly more floral note from the lavender. We were brought plates of bread with oil and vinegar. Knowing that I wanted to work my way through quite a few things, I didn’t spend much time on eating right away. Quickly, the appetizers came out to kick off round 2. 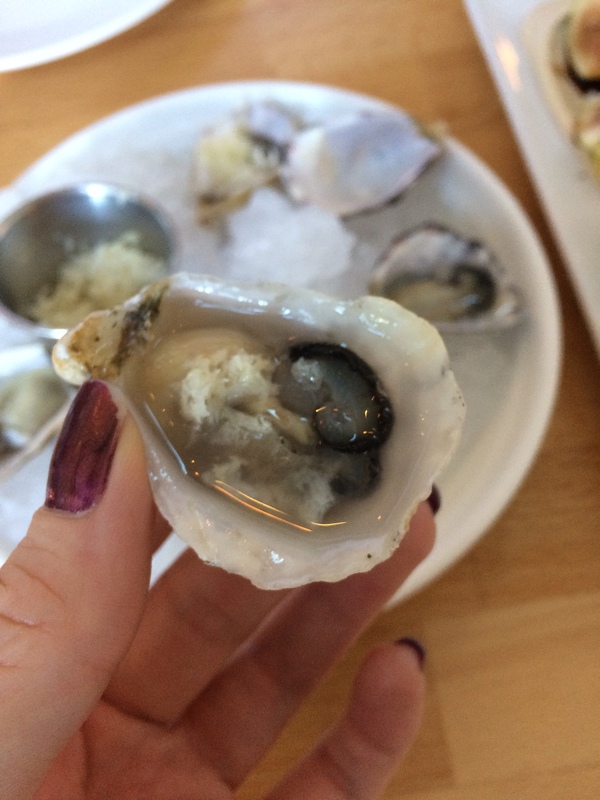 We started off with the oysters, slurping our way through them quickly with a sprinkle of horseradish and a splash of lemon. They were cool, salty and delicious. 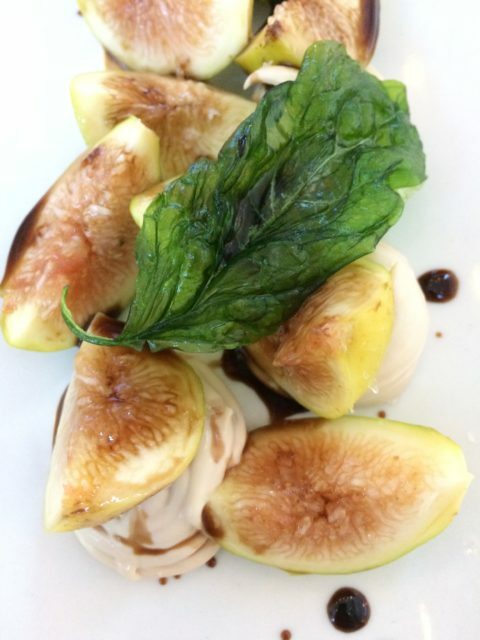 We moved on to the figs, with basil, foie gras and balsamic vinegar, a creamy change from the briney-ness of the oysters. The thick flesh and sweetness of the figs a perfect contrast to the richness of the foie gras. This was probably my favorite appetizer we had. 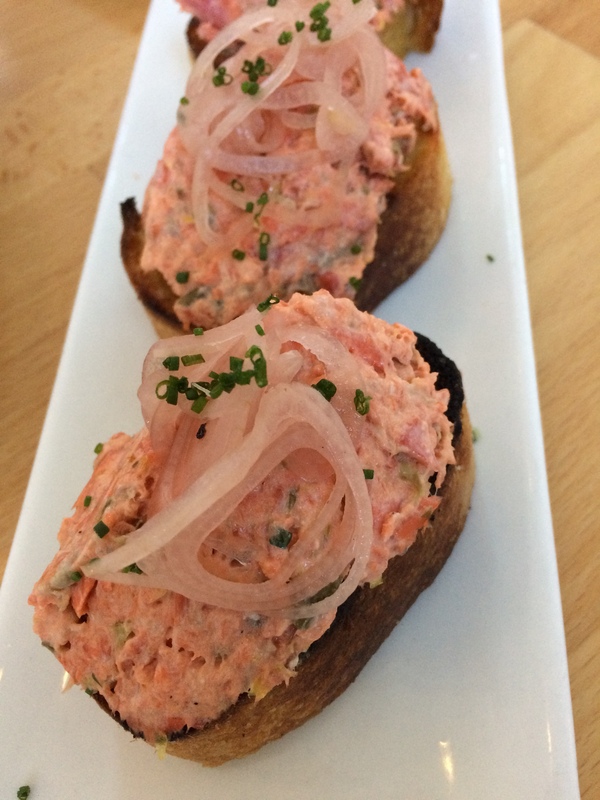 The third course was the smoked fish and steak tartare, both served with toast. 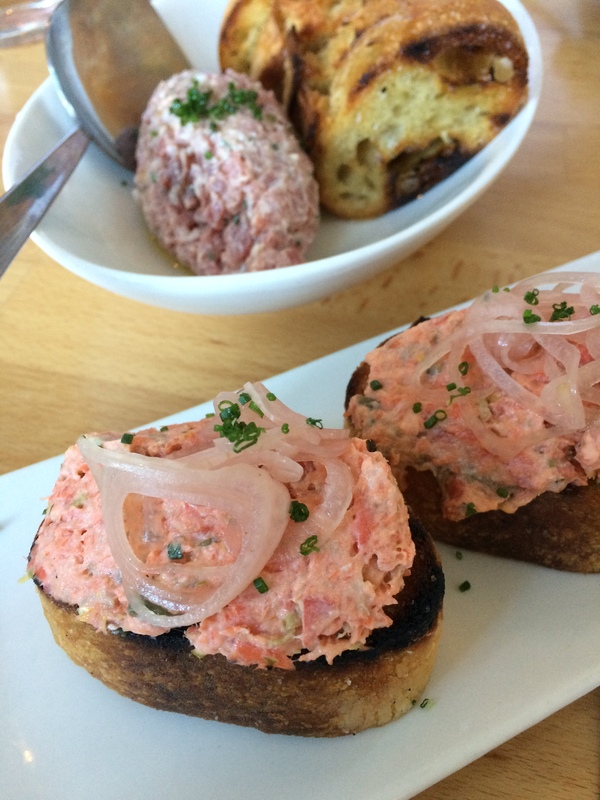 In retrospect, I wish I would have skipped the smoked fish and gone with the albacore crudo. It’s not that the smoked fish wasn’t good, it just wasn’t the caliber of the other dishes, and was too rich paired with the creaminess of the steak. I will say that the pickled onions were a nice bite and crunch to the fish, before hitting the bread. We took a cocktail pause here while we waited on our pasta. 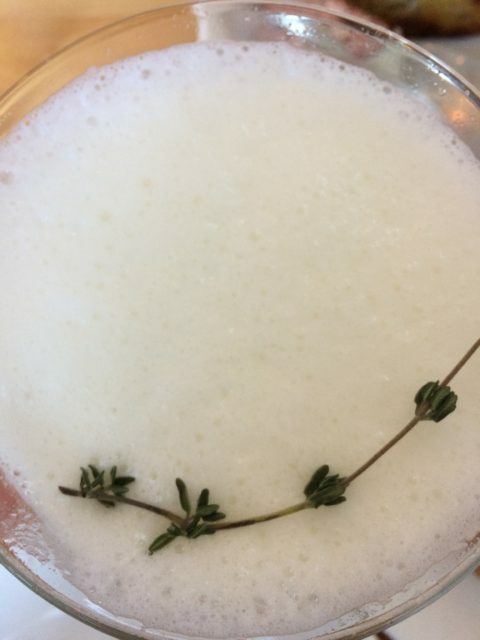 I opted for the Otra Vez, a foamy and earthy concoction of tequila, citrus, thyme and egg white. Nick opted for the El Casino, a smoky and spicy cocktail with mezcal and blackberry and bitters. Both cocktails, while unique, I wouldn’t have again. While I normally like mezcal, having it paired with the Firewater Bitters felt like I was drinking boozy liquid smoke. The Otra Vez had the right taste, but the texture of the egg white foam just didn’t lay well in my mouth. I’ll stick with my standard pisco sour in the future. 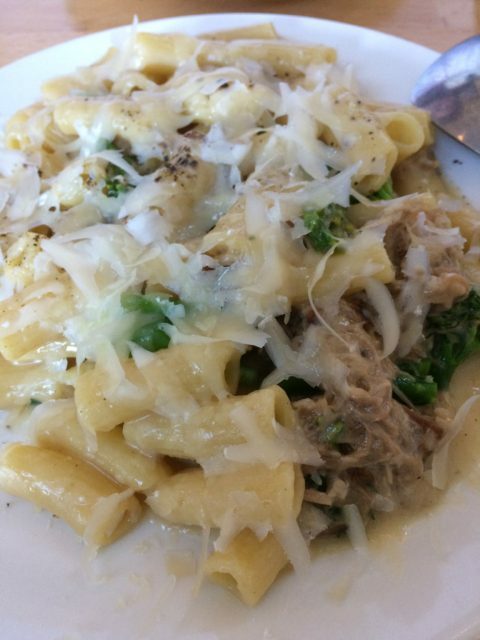 The fourth course we opted to split a full portion of of the rigatoni with pork sugo and broccolini. It was simple, but so comforting. The pork was tender and went really well with the still firm broccolini. I could eat this every day and be a happy gal. I had the 2015 iLauri “Nora” Chardonnay which was perfect for a warm day and a rich dish. Course 5 was all about the sweets. 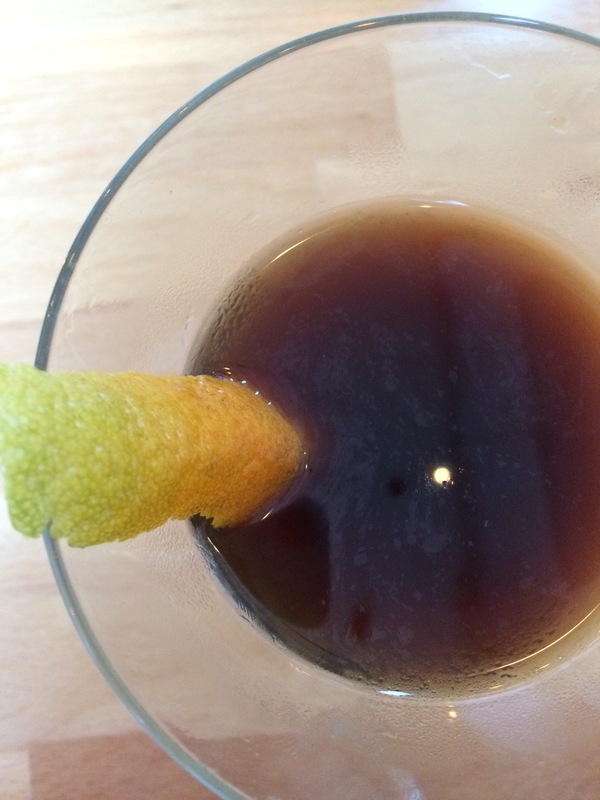 We had a cocktail with amaretto and orange and coffee liquers. 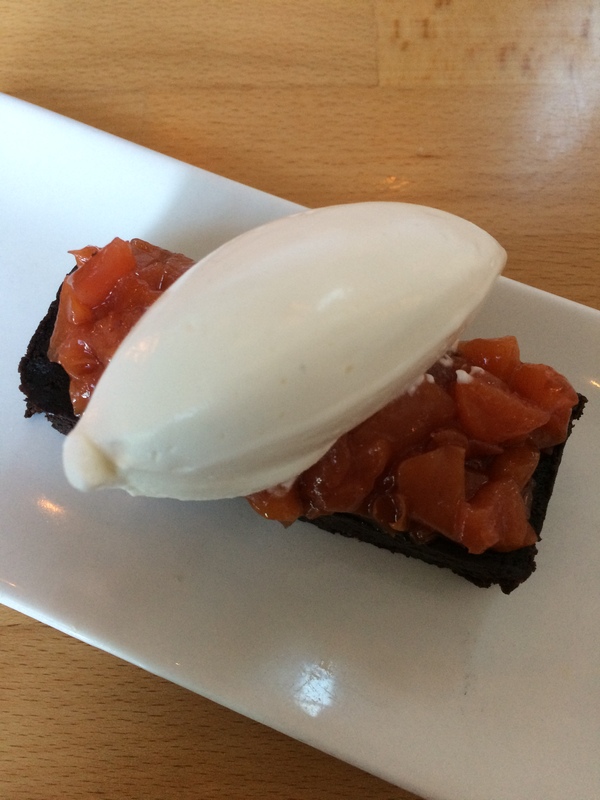 We paired it with the flourless chocolate torte topped with poached peaches and vanilla gelato. It was definitely enough for two and wasn’t sweet, instead letting the slight bitterness of the chocolate shine while the fruit provided the sweetness you’d want from a dessert. Final price for 2 and more food than we could eat? Just around $200. 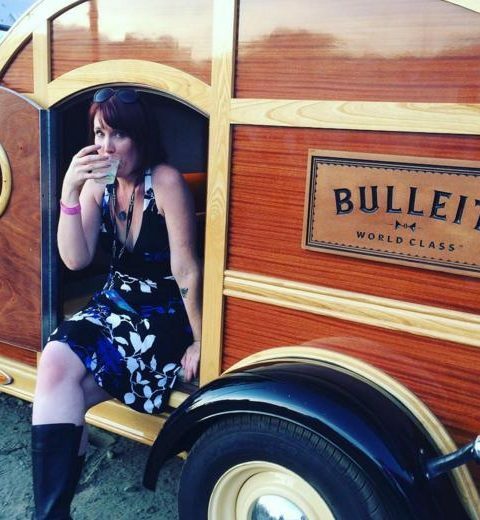 Did we need to order all those rounds of drinks? No, and that is what ate up some of the cost. Was it worth it? Absolutely. When you think about eating for a few hours, kidless, with multiple courses and drink pairings, it’s a pretty darn good value. Did I mention being kidless for a few hours? When momma needs a date night, there’s no putting a price on that happiness. 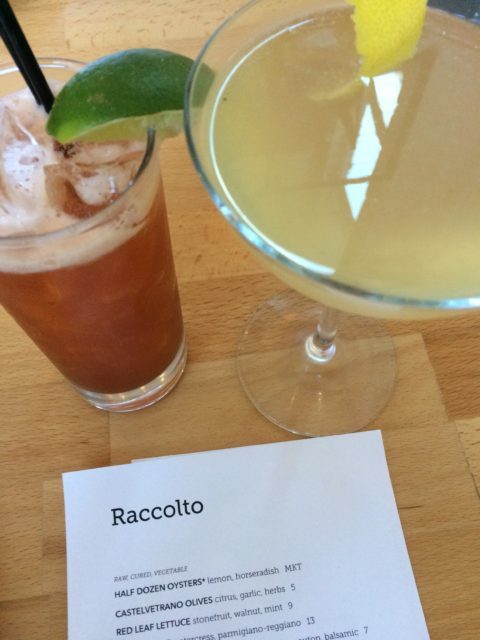 Well, dear reader, there you have it-a delicious recap of Raccolto! Where should I eat next? This entry was posted in Food, On the town, wine.